When you have chosen the home that you want to make an offer on, you first need to decide how much to offer. If the home you are bidding on is a new listing, and in particular if it is a bank-owned (REO) property, there may be several buyers putting in offers simultaneously, and you may need to offer above the asking price to compete with them. In this case we can discuss with you what level of competition there may be for the property, and what your chances of success may be at different price levels. If the home is a regular sale or a short sale and it has been on the market for a while, your offer may be the only one on the table. Then you would normally expect to offer less than the asking price. But where do you pitch your offer? If the property isn't a foreclosure, then you have to convince the seller (the owner) to accept your offer, or at least counter it. If you aim too low, then you risk alienating the seller, who may decide to reject your bid and also to take a negative attitude should you later go back at a higher offer price. So it is important to be realistic. You should be aware that it is rare for a sale to close at a price that is more than 10% below the listing price, and that almost NO properties sell at a discount of more than 15% from the listing price. So if you offer, say, 20% below what the seller is asking for you will have no chance of success and a good chance of losing the home for good. So what is realistic? Here is a chart showing all the homes our clients have bought in the past few months, showing the discount or premium against the listing price. Nearly all of the homes sold at a premium were bank-owned and short sale listings where the asking price was set low with the objective of attracting multiple offers. So if you are in that sort of situation, be prepared to bid up to 10% above the asking price if you want to be competitive. 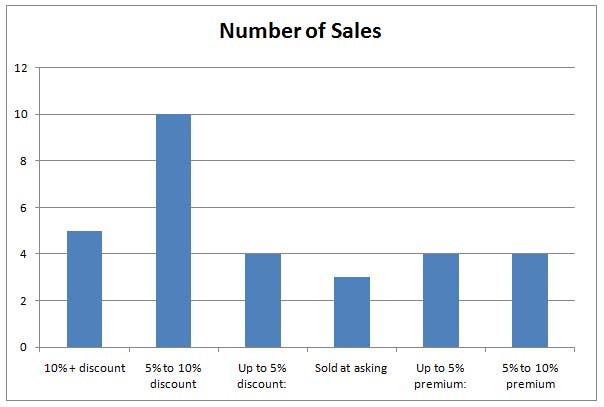 Looking at the regular sales, which are mainly the ones that sold at a discount, you will notice that most sold for 5% to 10% below the asking price. So as a general rule, an opening offer may be in the region of 10% below the listing price, or perhaps 15% below if the home is a bit overpriced. Whether or not the seller will accept, or even counter, an offer 10% below what he is asking depends on several factors, including his motivation to sell. Not all sellers will agree to a sale below the asking price, so don't be too surprised if things don't always work out as you would want them to. There are two sides to the negotiations: what you as the buyer would like to pay, and what the seller would like to receive. If there is substantial gap between the two sides, it may not be bridgeable.